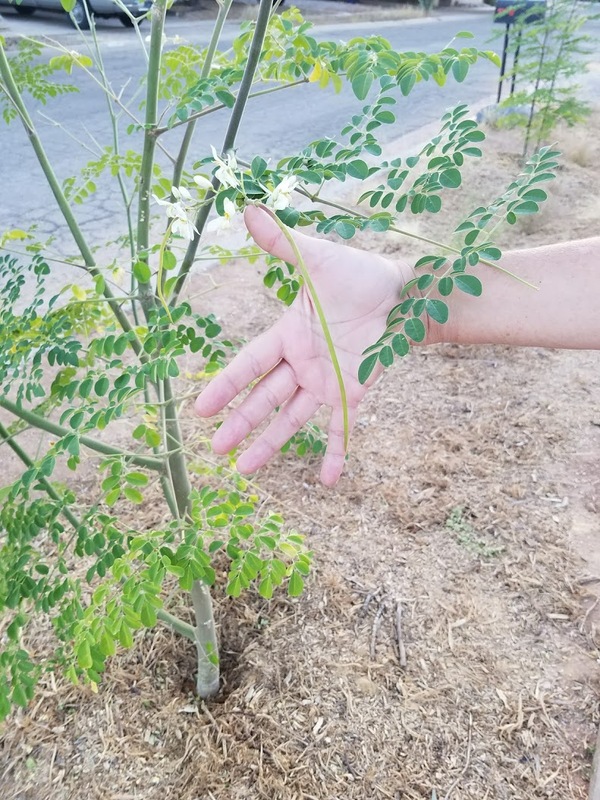 Remember when we first planted the moringa seeds in our roadside basin this June? We crossed our fingers and hoped that they would get established before the monsoon storms roared in. We knew moringa were drought tolerant, but wow! We had no idea how much they would grow - even after we stopped watering them. 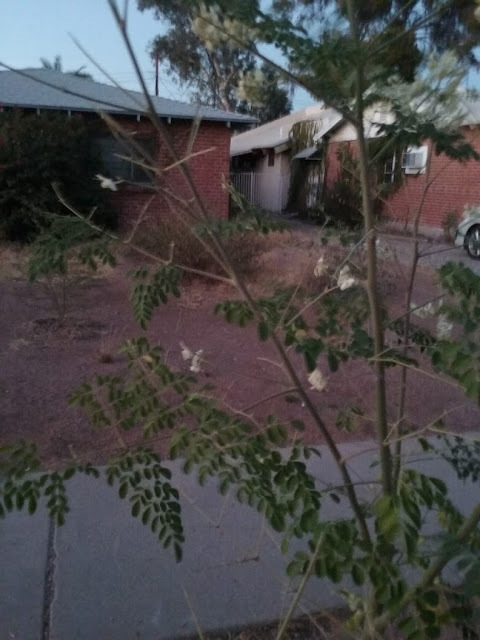 Just as we headed off for a long weekend, we noticed they had started blooming. Couldn't wait to get home and share pics with y'all. 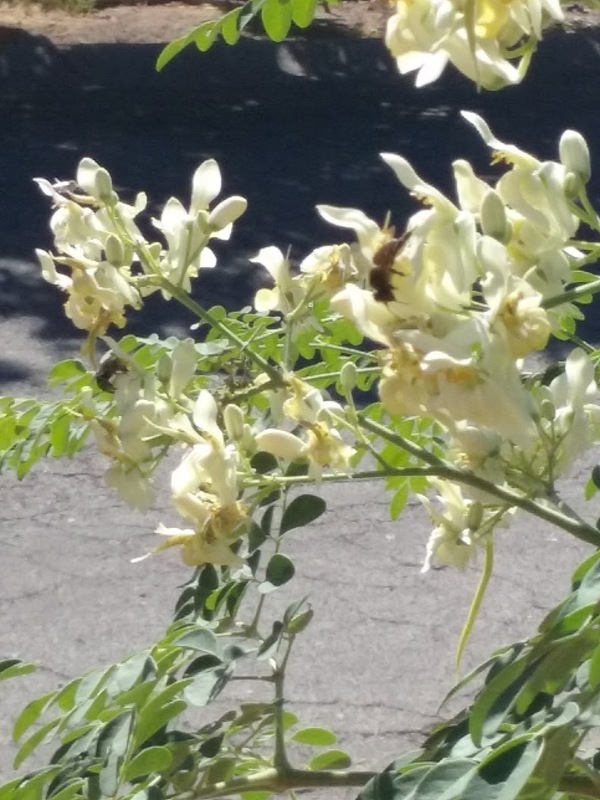 When we got back, we were delighted to see bees pollinating the blooms! But then I noticed something disturbing - several branches seemed to be snipped off. We assumed that a neighbor had harvested some of the edible leaves while we were away. No biggy... I had given several dog walkers a taste of the radishy leaves and offered them as a morning moringa supplement. We couldn't eat them fast enough anyway. Just wished that they hadn’t harvested from our fullest tree - before we got a good pic! The next morning there were more leafless branches. 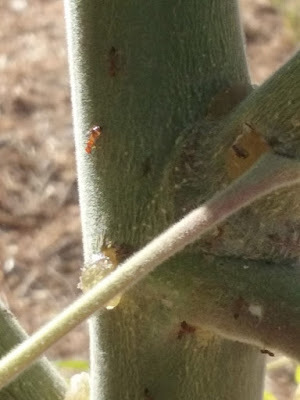 Ants were climbing up the trunk to the tiptop leaves. I thought they might be leaf eaters, but Dan pointed out that there was no trail of ants carrying leaves back to their hole. Closer inspection uncovered a bunch of ants really chawin' down on the trunk. and the sap seeping from it. Just when we were looking forward to the blooms transforming into yummy foot long seed pods, it looked like they were all going to be devoured by ants. That evening they were still going at it so Dan poured cinnamon around the trunk. 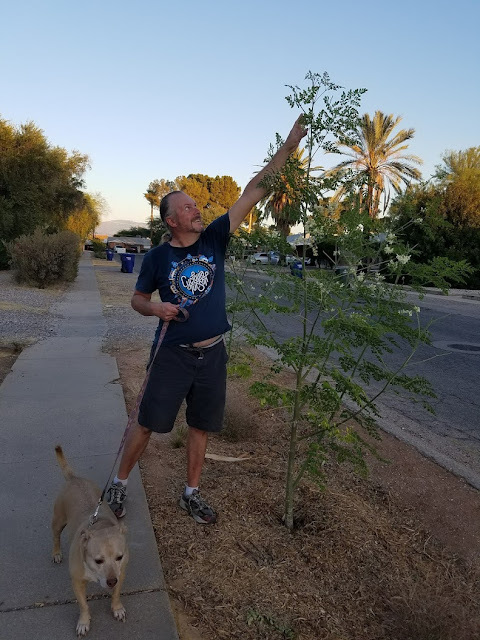 (That had stopped ants from tracking into our kitchen after all...) A neighbor suggested that we put cayenne pepper around the trunk. He knew some farmers who planted them in their gardens to keep out ants. 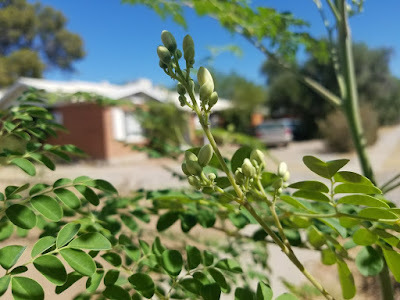 The next morning, our moringa was buzzing with activity. I spotted a little grasshopper sitting on a stark branch. The bees were busy pollinating. 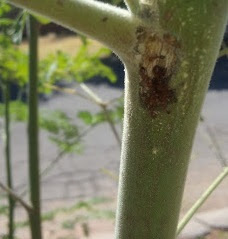 And yes, the ants were still climbing the trunk and sinking their jaws into the yummy flesh. Yep, we have ourselves one extremely edible plant. Our edible plant! 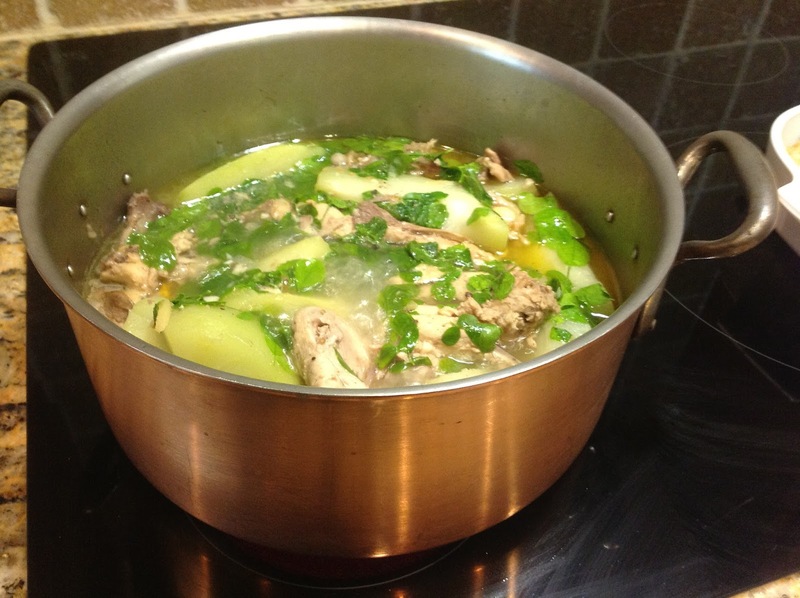 And we hadn't even gotten to try Filipino moringa soup yet! This was war! 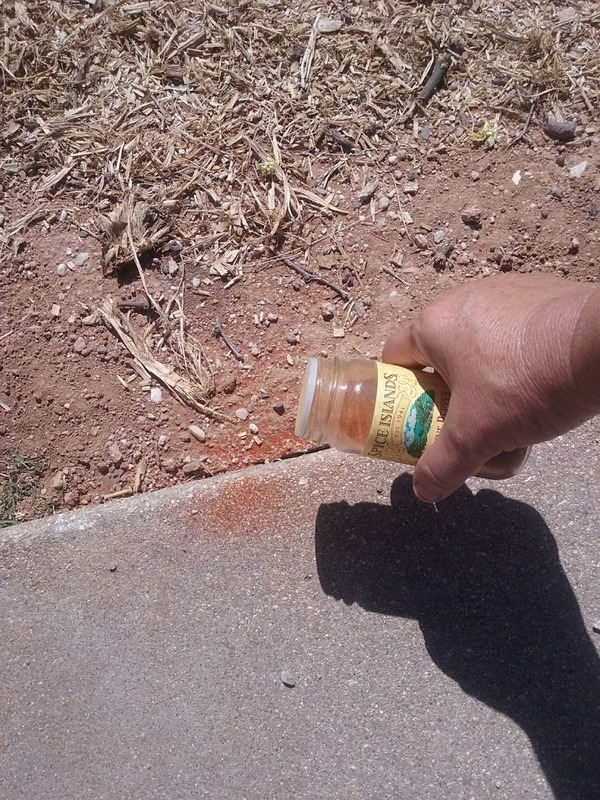 I got out the cayenne pepper and sprinkled it into the hole the ants had eaten through. I put it around the trunks (with the cinnamon). But there wasn’t enough for all four trees, so I went searching for more in the pantry. I found something red. 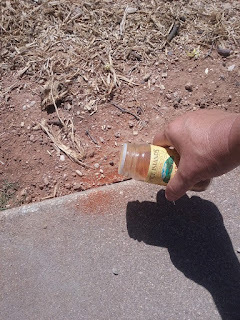 I sprinkled it into the ant hole by the sidewalk and along the trail of ants. When I checked it later I found that it hadn't deterred those determined ants. In fact, they were marching right through it. I took a little taste - it was taco seasoning! I searched for something more deadly - super hot New Mexico green chili powder. 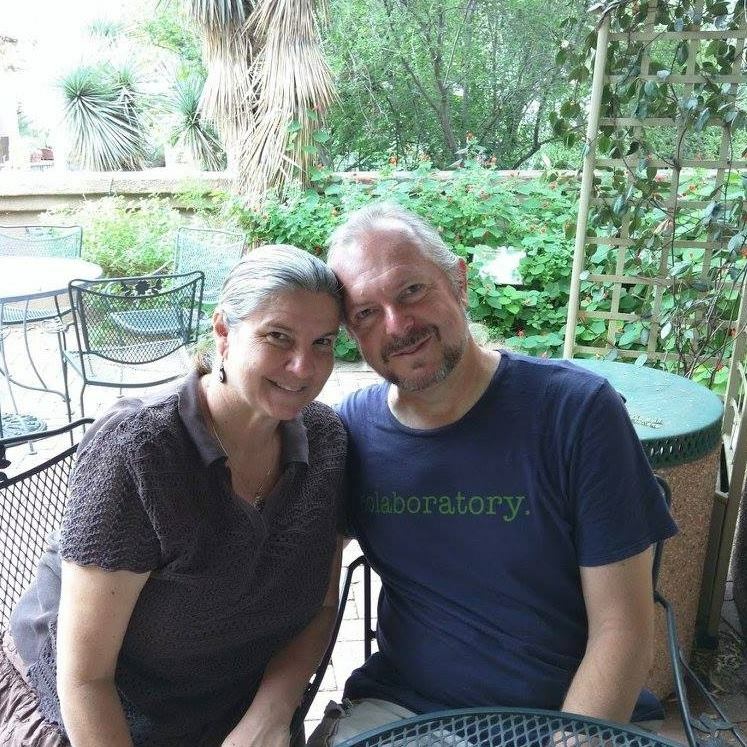 If they didn't care for cayenne pepper, they would hate New Mexico green chili. I sprinkled that over the taco seasoning. 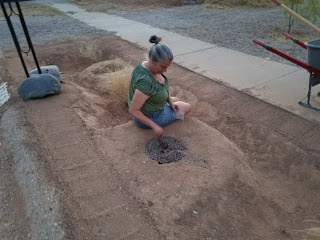 I filled the ant hole beside the sidewalk with it. But ant holes multiplied in the mounds of green chili. Were they taking it home? I spotted a little lizard waiting to climb up the trunk. I remembered another lizard who had reared up on it's hind legs to chomp on some amaranth leaves. 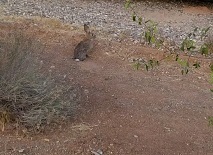 Recalling the leafless amaranth plant, I chased the culprit away. 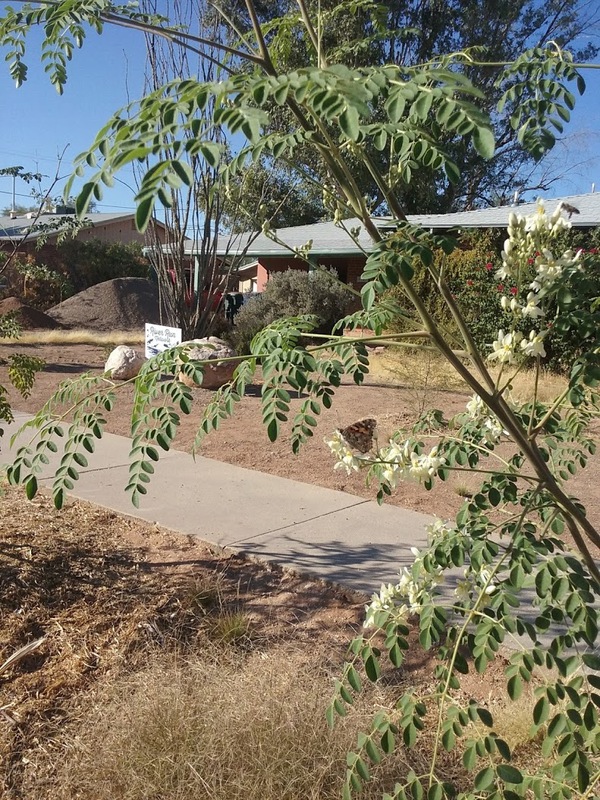 We always expected to share some of our moringa with the desert critters. But did I really have to serve 'em five alarm 4 spice moringa chili!? I checked the hole in the trunk where I poured the cayenne pepper. At least those ants were gone. So the cayenne pepper had actually worked! Lesson learned. 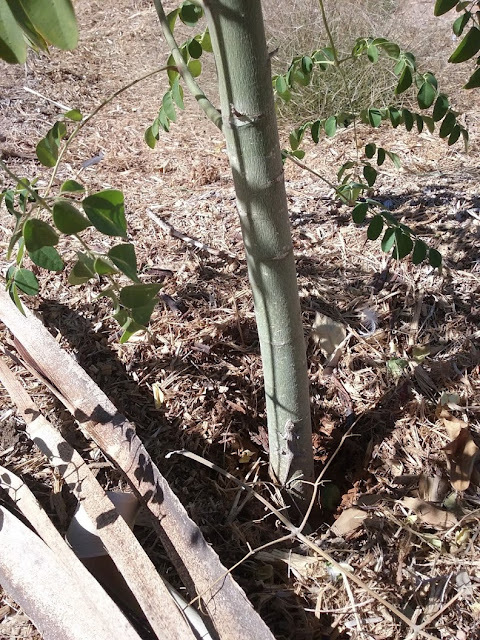 2018 UPDATE: I found this video that demonstrates a good way to keep ants from destoying your moringa. I'm gonna try it before they get to another moringa! Just in case there is any left for us: Cooking with Moringa Moringa curry directions. How to grow them in a pot in Tucson.